Posted Oct 02, 2018 by Eds. Naomi Klein, The Battle For Paradise: Puerto Rico Takes on the Disaster Capitalists (Haymarket Books, 2018). 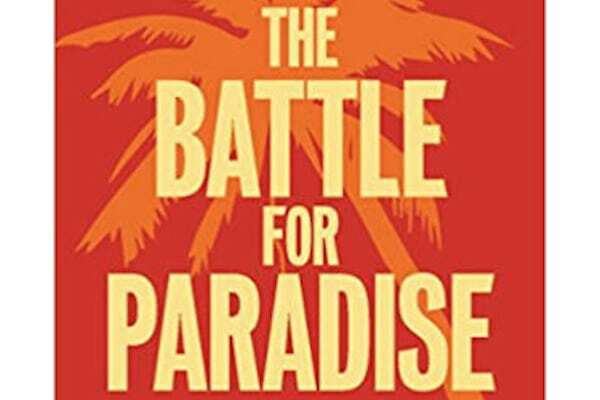 Klein acutely exposes a vicious battle that is being waged in the beautiful archipelago of Puerto Rico, between the inhabitants fighting for a country that is equitable, democratic, and sustainable for all, and a group of wealthy neoliberals who are angling to buy up the country as a playground and tax haven for the very rich. The neoliberal assault is moving quickly: speed is part of their strategy in achieving their goal; but the Puerto Ricans have been coming together in a brave and organized way to fight the assaults and determine their own destiny. After a tsunami wipes out the coasts of Southeast Asia, the pristine beaches are auctioned off to tourist resorts…New Orleans’s residents, scattered from Hurricane Katrina, discover that their public housing, hospitals and schools will never be reopened…These events are examples of “the shock doctrine”: using the public’s disorientation following massive collective shocks–wars, terrorist attacks, or natural disasters-to achieve control by imposing economic shock therapy. Klein spent a week with PAReS visiting various parts of the country, researching topics of debt and privatization, and energy and food sovereignty. The week was concluded with a full-day gathering of more than sixty organizations that had already been fighting against disaster capitalism. These groups subsequently created the network JunteGente and they have continued to meet, with the aim of uniting the various struggles for the future of their country. Hurricane Maria had left the country with its entire infrastructure destroyed, a complete electric-power shut-down and roads blocked by mud washed down from surrounding mountains or fallen trees. The highly industrialized southern coast had not only suffered a complete power blackout (despite the proximity of two of the island’s largest electricity plants) but also the effects of heavy flooding. Coupled with this were fears that the deluge had stirred up toxic materials from nearby fuel burning power plants and agricultural testing sites. The bleak situation was exacerbated by stifling heat. A drive into the small mountain city of Adjuntas revealed an entirely different situation. In the midst of the darkness into which the whole country had been plunged, they arrived at a large pink colonial-style house, with light shining from every window: Casa Pueblo community and ecology centre. The centre had been equipped with solar panels twenty years before, a move that had been criticized at the time for being for being ‘rather hippy-dippy’, but which miraculously had not been damaged by the hurricane. Naturally the people from the surrounding area flocked to this beacon of light. In the following days and weeks, the centre, which had already been a hub for the community before the storm, provided food, water, tarpaulins and chainsaws, and importantly, electricity for charging up their electronic devices. Casa Pueblo’s radio station became the sole source of information, as all power lines and mobile-phone towers had been knocked out. Importantly, the centre also became a makeshift hospital. Casa Pueblo is a strange hybrid of ecotourism lodge and revolutionary cell, founded 38 years ago by a family of scientists and engineers in the small mountain city of Adhuntas. Arturo Massoll-Deya, president of Casa Pueblo’s present board of directors, had for years pressured for Puerto Rico to get far more of its power from renewables, warning of the risks of the country’s overwhelming dependence on imported fossil fuels and centralized power generation. The island has no domestic supply of oil, gas or coal, all of which are imported by ship. ‘One big storm, he had cautioned, could knock out the whole grid–especially after decades of laying off skilled electrical workers and letting maintenance lapse’ (p.5). Because the centre had survived the devastation of the hurricane and was the only sustained power for miles around, it became a crucial nerve centre for self-organized relief efforts; it was weeks before Federal Emergency Management or any other agent would arrive with sufficient aid. A term referring to a combination of traditional farming methods that promotes resilience and protects biodiversity, a rejection of pesticides and toxins, and a commitment to rebuilding social relationships between farmer and local communities (p.34). Each grade grows and harvests their own crops, some of which is served in the school cafeteria, some sold at market, but most of it goes home to their families. This public school’s farm is unfortunately a rare anomaly in Puerto Rico. About 85% of the food eaten by Puerto Ricans is imported, as much of the island’s agriculture is on an industrial scale, with many crops being grown for export or for testing purposes. This is an economy first established under Spanish rule, a legacy of slave plantation days. The status of Puerto Rico has been the main political issue on the island since it was annexed by the United States in 1898 after the Spanish-American War. It now operates as a quasi-state of the USA, as Congress has ceded to it small amounts of autonomy; although it has an independent, elected local government it lacks the power and benefits of being a state, with no real representation in Congress. The Puerto Ricans have been fighting over their political status for decades, but Congress has has shown little interest in changing anything. By giving the fiscal board the power to reject decisions made by Puerto Rico’s elected territorial representatives, they were now losing the weak rights they had won through struggles in the past, marking a return to un-masked colonial rule (p.49). This was the situation even before the devastation caused by hurricane Maria. These measures are now being aggressively advanced by Governor Ricardo Rossello in meetings with bankers, real-estate developers, cryptocurrency traders, and the Financial Oversight and Management Board (p.13). This is a classic demonstration of Klein’s ‘shock doctrine’, of using the public’s disorientation following a massive shock such as war, terrorist attacks or natural disasters to achieve control by imposing economic shock therapy. The jury is still out as to whether this latest attempt at the shock-after-shock doctrine approach will actually work. If it does, it will not be because Puerto Ricans suddenly overwhelmingly approve of these policies. It will be because the tremendous impact of the storm has disassembled life for millions of people, making the reconstitution of the pre-storm, anti-austerity coalition a herculean challenge (p.54). Capital is fast. Unencumbered by democratic norms, the governor and the fiscal control board can whip up their plan to radically downsize and auction off the territory in a matter of weeks – even faster, in fact, because their plans were fully developed during the debt crisis. All they had to do was to dust them off and repackage them as hurricane relief, then release their fiats. Hedge fund managers and crypto-traders can similarly decide to relocate and build the “Puertopia” on a whim, with no one to consult but their accountants and lawyers (p.74). The future for Puerto Rico? Unite their various causes into a common vision for a radically transformed Puerto Rico…grounded in an unabashed insistence that despite centuries of attacks on their sovereignty, the Puerto Rican people are the only ones who have the right to dream up their collective future (p.76). Two visions for the future of Puerto Rico–two diametrically opposed versions of utopia–are running fast and in parallel: but at some point, the two will collide. Let us hope for justice for the people of this beautiful paradise, that at last the brutal hand of colonialism in all its forms will be eradicated, that they can look forward to a future that is equitable, democratic and sustainable for all.